Come join Brevard County 4-H for our annual 4-H Fair & Market Poultry Auction on Friday, April 5th and Saturday, April 6th at the UF/IFAS Extension Brevard County office in Cocoa! This event is free and open to the public, so be sure to stop by to admire 4-Her’s displays of creativity and talent. 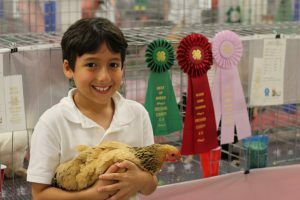 You’ll be able to socialize with our youth exhibitors, participate in the silent auction, and bid on market poultry birds during the live auction. The market poultry auction will be held on Saturday, April 6th beginning at 9 AM with our pancake breakfast social. This is the perfect time to chat with 4-H members and learn all about their projects before bidding on their birds when the auction begins at 10:30 AM. For the past eight months, 4-H members have been raising their chicks in preparation for this annual event. This year, over 100 Cuckoo Marans laying hens will be auctioned off by our youth. Proceeds from the auction will go back to the 4-H members to help them fund their animal projects for the coming year. The 4-H Fair is an excellent opportunity for Brevard County youth to exhibit the projects they have worked hard on all year. 4-H members can complete projects in poultry, rabbits, horticulture, fine arts, cooking and baking, goats, STEM, and so much more. All their hard work will be on display for the duration of this year’s fair. And while 4-H youth do earn ribbons for exemplary projects, their work in 4-H earns them so much more. 4-H is the only youth development program that is proven to teach youth essential life skills such as responsibility, teamwork, and problem solving. This helps to develop lifelong leaders. For more information on 4-H and this year’s 4-H Fair & Market Poultry Auction, please contact Andrea Lazzari, 4-H Agent, at (321) 633-1702 or a.lazzari11@ufl.edu.